A standing woman addresses a man seated in a folding chair. Woman: Creationism is simpler than evolution. Applying Occam’s Razor, creationism must be the right theory. The man is seen standing and gesticulating. The chair is empty in the background. Man: No, no! You’re applying Occam’s Razor all wrong. Let me show you how it’s done. The scene now shifts to what appears to be a bar with a different man with an unshaven face, seated at the counter, stooping in a dejected pose, and holding a drink in his hand. 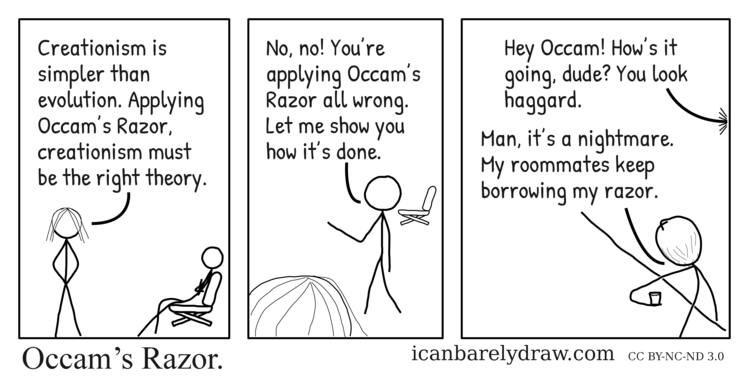 Voice from the background: Hey Occam! How’s it going, dude? You look haggard. Dejected unshaven man: Man, it’s a nightmare. My roommates keep borrowing my razor.